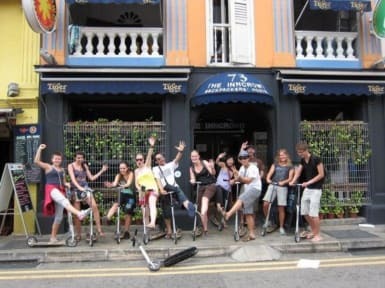 The InnCrowd Backpackers Hostel 2 i Singapore, Singapore : Boka nu! Staff and location was great. It also felt very clean even though it was a simple place. Would stay again when in Singapore on a budget. Good breakfast, WiFi is a bit unreliable, works from time to time. Good showers. Doors to rooms are always open but they’ve got safe lockers. Very basic hostel that is fine for a few days and a good free breakfast as well. Its an ok hostel. Had no toilet on my floor. Kinda annoying if you stay a while. No AC on daytime. But frindly staff, breakfast and near a metro station. Not 100% happy with this hostel. The AC is off during days so it’s almost impossible to be in your room during that hours. There’s no locks to the doors into the dorms, so anyone can just walk into your room. The wi-fi is really bad and doesn’t work from time to time. But on the positive side, the location is awesome, just 1 minute to the MRT. Little India is very cozy! The female receptionist is one of the nicest people I’ve ever met, she will help you with everything.